УДК 167 + 535.315 +303.832. Аннотация. В статье освещен основной результат диссертационного исследования, относительно описания прототипа понятия междисциплинарной призмы и фильтров. Понятийный аппарат позволяет раскрыть сущность сложных процессов междисциплинарного исследования. Предложенный материал носит фундаментальный характер в области междисциплинарных наук. Новизной работы является четкое описание методологического понятийного аппарата междисциплинарных исследований. Дано четкое представление научному обществу, что такое научная призма и фильтр. Ключевые слова: междисциплинарные исследования, междисциплинарная призма, фильтр, ученые. The problem of investigation. Modern information society is characterized by complicated processes. They have already reached a such level of development, that it becomes more and more difficult to differentiate on the physical and verbal level. For the essence of the thesis is a complicated multi-faceted process of the object research. It is impossible to provide it professionally without systematical decomposition of the object into proper structures (components, processes). Complicated object of the research is trans-disciplinary and interdisciplinary. It is characterized by a lack of clear boundaries between the science directions that are involved in the research. It dictates to the modern scientific community the creation of interdisciplinary consolidation according to the challenges provided by the Bologna declaration [1, 2]. So it is impossible to solve this issues without a systematic approach, that is why it explains the failure of the thesis researches of predecessors. sixthly, to complete List  by magazine, which will show the main results of the thesis for the interdisciplinary science, for example, by a pilot project . Let’s concentrate on the decision of the first question. The analysis of recent researches. In the article "Ідея побудови міждисциплінарної призми”  was developed and tested the idea of the concept of interdisciplinary prism. This concept has broad and important fundamental sense to the science community. The article "Кредитная война и её последствия: опыт Испании” is a complex multi-faceted interdisciplinary research work. It contemporaneously mixed the following research areas: economy, political and military science, public administration, international law and pedagogy. Thus, the purpose of the article is to highlight the main results of the thesis, targeted at creating of the interdisciplinary prism, which will be able to decompose the complicated process of research on components and filter. The results of the research. In the research authors used method of analogies and allegories to confirm hypotheses or theories that are still pass a vital stage of proof applicable. It allows explaining on a verbal level of clue researchers. 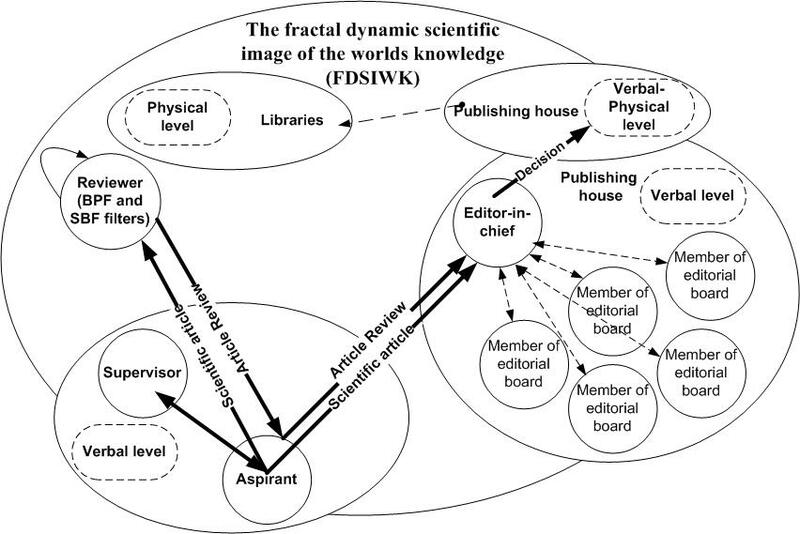 Verbal level plays an important role in the initial formation of the fractal dynamic scientific image of the world’s knowledge (FDSIWK) of individual. Let’s describe the structure and features of interdisciplinary prism based on well-known tested, proven and tested in time analogies. A similar equivalent of the interdisciplinary prism introduced in the abstract "Спектральные приборы” . From physics we know that the optical dispersive prism has the unique feature – it is a decomposition of monochromatic light on the spectral component. As a result of light passing through the dispersive prism, we have its decomposition into a continuous spectrum. The spectrum is clearly highlighted by seven main colors. Between the colors exist a graduation, it is a light gamma. The process of defining the clear boundaries of colors in the dispersive spectrum is difficult. It cannot be done without using auxiliary devices. Therefore, instrumental methods and devices, based on spectral analysis, must be applied . A number of objective and subjective interrelated factors influence on the result of the evaluation of boundaries. At the center of these factors is a person, as an individual with his scientific view of the world, formed in the cerebral cortex. According to the analogy to light, the science is complicated and phenomenal fact as well. This phenomenon is dynamical and constantly changes its boundaries. It should be noted, that the boundaries of the modern scientific directions (fields) are determined in the List of scientific specialties. According to this specialties are held Ph.D. thesis, postdoctoral researches and awarding academic degrees . However, they are not draw up clearly. In the same way main scientific spheres are identical to the basic colors of light decomposed by prism  (Fig. 1). They exceed a number of basic colors only by number of scientific spheres. The light gamma between basic colors is a science specialties in a proper scientific sphere. This analogy shows us a clear image of the composition of sciences. It is an idealized representation. After the inverse transformation, passing through the prism the List of sciences, taking to consideration the history of science, we have obtained as a result the initial point of origin of the science - philosophy. So, by deduction, we came to the obvious conclusion, that all modern scientific directions, which are identified in the List, historically resulted from philosophy (modern philosophy, pedagogy, physics, mathematics, etc.) . In that reason, we came to the suggestion, that the List  can be considered as a result of the transmission of philosophy through the prism of science and, therefore, it is a science spectrum. Thus, ancient philosophy is a similar to monochrome white light. This example clearly shows the proof of the similarity admissible analogy. It is important to apply the prism analogy stated above to explain the processes that occur during interdisciplinary researches. One of their main tasks is the logical search of boundaries. It is similar to search of the light gamma boundaries in the dispersive spectrum of light. This search was conducted on the joint of two basic colors. If it really was in that way, so, it was enough to offer addition to every science sphere by interdisciplinary specialty in the List. This variant is discussed in the article "Место в перечне научных специальностей междисциплинарных диссертационных исследований в науке и образовании” . However, in the science practice the symbiosis could get much more complicated. To gain deeper insight into this issue, let’s pass from the idealized model of prism to the realistic one. For this, we transform optical dispersive prism into similar realistic interpretation. Interdisciplinary prism has not any similarity in shape in comparison to the physical dispersive optical prism. Its form has no important value; rather it looks like a round table. The usage of a prism with the prefix "interdisciplinary" is more appropriate to methodic system for advanced research of spectrum. - between different specialties of different spheres of science. - ideally the number of experts should coincide to the number of scientific spheres and specialties. But the more experts in the system, the greater objectivity and less subjectivity appears in the final estimation . This membership of the expert system will provide high quality decomposition of the researching object on basic research spheres. The identification depends on interdisciplinary knowledge (competence) of the expert system members. We will not discuss in details the expert systems work, because it is not a target of our research. 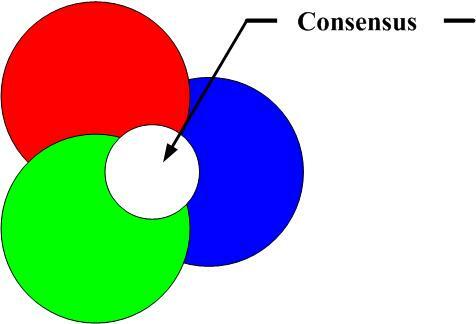 According to the principle of the acceptance of consensus, its construction is the subject of many articles. The principles stated above fully confirm that the objectivity of evaluation depends on the number of individual subjective estimates of experts. Thus, the intersection of the subjective estimates of experts is a consensus solution. It is identical to the laws of the intersection of sets and clearly demonstrated by the example of graphic color models RGB triads, used to create color images on the screen cathode ray tube (see Fig. 2). Therefore, mixing red, blue and green colors in the appropriate proportions and intensity, we get a white circle. It is a circle of consensus decision. We have described a balance of expert’s placement in the scientific spheres; nevertheless in practice this placement is disproportionate. It occurs when in the expert’s system assist not all experts of this direction, or over evaluate the role and priority of certain subgroups of experts on a particular scientific direction. This fact leads to increase of influence of the subjective evaluation of any undesirable science sphere. Our suggestion is supported by the concept of aspect, which is often used in humanities research. Aspect (Latin "aspectus” - look) - point of view, which perceives or evaluates this or that phenomenon, object, event. So, the aspect - is the process of the target consideration of study of any phenomenon. It is important to define the role and place of the meaning of aspect in the concept of interdisciplinary prism . Since the aspect means the consideration of the certain question in the proper point of view and the filtration of the all unnecessary, we find the analogue-allegory of it. From technical sciences we know the theory of electrical circles constructing, which means that filtering function provides filter. Filters are classified by the features of properties. Some of these properties are transformed into the concept, but some - no, because of the impossibility of bringing analogy. Here's classification, which we transformed visually into the analogy. Filters are classified: low-pass (LPF, Fig. 3, a) high-pass (HPF, Fig. 3 b), band-pass (SF, Fig. 3, e); stop-band filter (barrier, RF, Fig. 3, g). Electronic filter – is a device for separating the desired components of the electrical signal spectrum and / or suppression of undesirable. If the filter is considered regarding to the light, it is completely transformed according to the concept. Якщо фільтр розглядати відносно світла, то він повністю трансформується під поняття. Low-pass filter (LPF) – is the filter that passes low frequencies and does not pass those frequencies, which are above the filter’s cutoff frequency. High-pass filter (HPF) – is an electronic or other filter that transmits high frequencies of input signal, however does not transmit signals on the lower than the cutoff frequency. Band-pass filter (BPF) – is an electronic filter that passes signals within a certain range (band) of frequencies and attenuates (cuts) the signals of frequencies outside this band. As an equivalent we can give appropriate example – is the expert system that misses some ideas from the certain scientific direction, or sphere, and the rest of ideas are separated. Stop-band filter (SBF) – is an electronic filter that does not pass signals of the certain range of frequencies, but passes the signals of other frequencies which do not belong to this range. As an equivalent we can give appropriate example – is the expert system that does not pass, but underline the ideas of the certain scientific direction, sphere. In the spectrum of light exist the boundaries of frequency, which can be measured by the spectral means . Touching upon this problem, it is difficult to determine the scientific boundaries. These boundaries are mostly imaginary and dynamically changeable (expansible). On this account, it is appropriate to study abstract boundaries, such as scientific sphere, specialties, direction, but not like particular numerical indicators boundaries, as it means technical filters. The explanation of the choice of abstract boundaries is the fact that there is no hierarchical classification, with exception of the List . Since the List is the result of consensus, it is possible and appropriate to be seen as a hierarchy of Sciences (like a ladder). In this connection particular importance should be attached to the aspect. The aspect is the certain point of view of the expert system relatively to the tested object, functions and properties that appear according to the analogy to filters. Taking into account the List  like the hierarchy of sciences (ladder), the term "frequency" is transformed into the equivalent of "science specialty". Only according to this meaning it is appropriate to talk about the possibility of realization of LPF and HPF, because in practice every scientific specialty can interact with all the List’s specialties. In this way forms a complicated, volumetric shape, which is difficult to describe. Aspect is frequently used in the humanities studies. So according to the accepted suggestions, aspect technically implements a band-pass filter. The reason of constructing of all filters clearly demonstrated on the basis of the expert system. The key element is an expert-man. Therefore, these filters are characterized by individual scientific knowledge from their own scientific sphere, specialty and direction. These properties are equivalent to the amplitude-frequency characteristic (AFC) and phase-frequency characteristic (PFC) of the radio filters. Practical realization of study results. Example of the implementation. Let’s observe the equivalent analogical schemes of filters and groups of experts in expert systems. Schemes are shown in Fig. 3. Construction and observation of LPF, HPF (are shown in Fig. 3, a, b, c, d) are logically obvious. However, the lack of the structured hierarchy of sciences generates the impossibility of the qualitative and quantitative description of equivalents for today. Therefore, it is useful to analyze this issue, as a perspective direction for further researches. In the connection of absence of the structured hierarchy of sciences, the practical implementation of BPF and SBF is similar with the inverse function. It means that the experts from the expert systems outline the majority or minority of the opinion about certain research sphere, specialty or direction. This necessity takes place in the research of small-section sphere of science, profession, knowledge, for non-distortion by other subjective points of view. The necessity of describing the interdisciplinary filter appeared from the necessity of describing the fractal dynamic scientific image of the world’s knowledge (FDSIWK). The FDSIWK proposed by authors, gives a complete visual structured representation of process, from the moment of the generation of scientific ideas up to transforming it into the acceptable appearance. It also includes such essential element of editorial and publishing process, as recommendations and reviewing. These elements appear obligatory in our mental system according to the formation of new scientific knowledge like on the verbal level, so on the physical one. This conception is clearly present in the following form on Fig. 4. The figure shows the clear role and place of the proposed filter. Conclusions. Based on the comparative analysis stated above, with regard to the mentioned problem of the article, it may be important to conclude, that according to the results of the authors’ research appears the necessity of describing the scientific filters . The most obvious appears the comparative analysis of the electrical circles theory to explain the main ideological principle. We use this approach for the following reasons. The theory, which is still on the stage of finding its basic principles and identifying fundamental concepts, cannot be logically justified . Thus, we use set following methods: comparison, analogy and allegory to justify our theory, which is still at the stage of finding and identifying the basic principles and fundamental concepts. Therfore, proposed concept of the interdisciplinary prism and the scientific filters fill the gaps in science researches and explain the actual processes, acting in all verbal and physical levels FDSIWK. The application of the tested expert system in this view helps to solve a number of issues in all science directions. As far as this issue is concerned, the actual problem remains the publicizing of received interdisciplinary scientific results, because for now there are no qualified scientific journals and the scientific filter that rejects the official recognition of the interdisciplinary science existence. It must be stressed on the usage of the same conventional terminology. It stipulates on language which speaks the brainpower of different scientific spheres, specialties and directions. It is an important condition for the creation of scientific consolidation for Interdisciplinary Research in science and education . Without such way of consolidation it seems impossible to provide researches, especially in the transitional process, until in the interdisciplinary postgraduate study (civil and military) will not start the training of scientific and pedagogical staff with interdisciplinary competence. The perspective for further research in this direction is the study of the allocation law of interdisciplinary prism. Obtained knowledge is necessary to direct on the formation of a new generation of scientific and pedagogical staff of high interdisciplinary competence. Construction and treating of LPF, HPF (shown in Fig. 3, a, b, c, d) is quite obvious, but the absence of the structured hierarchy (classification of sciences), leads to the impossibility of qualitative and quantitative description of its equivalents for today. Therefore, it is appropriate to bring the object of research to consideration, as the perspective direction for further research. 1. Бедный Б.И., Миронос А.А. Подготовка научных кадров в высшей школе. Состояние и тенденции развития аспирантуры: Монография. Нижний Новгород: Изд-во ННГУ, 2008. – 219 с. – ISBN 978-5-91326-100-7. 2. Козубцов І.М. Національні особливості та перспективні принципи удосконалення систем підготовки і атестації вчених в контексті Болонського процесу [Електронний ресурс] // Научный электронный архив академии естествознания. – Режим доступу URL: http://www.econf.rae.ru/pdf/2011/11/754.pdf. 3. Про затвердження Переліку наукових спеціальностей МОНмолодьспорт України; Наказ, Перелік від 14.09.2011 № 1057 // Офіційний вісник України від 17.10.2011 – 2011 р., № 78, стор. 215, стаття 2893, код акту 58517/2011. 4. Перелік наукових фахових видань україни, в яких можуть публікуватися результати дисертаційних робіт на здобуття наукових ступенів доктора і кандидата наук [Електронний ресурс] Затверджено постановами президії ВАК України від 27.05.2009 р. № 1-05/2. – Режим доступу URL: vak.org.ua/docs//prof_journals/journal_list/whole.pdf. 6. Мараховський Л.Ф., Козубцов І.М. Ідея побудови міждисциплінарної призми // Междисциплинарные исследования в науке и образовании. – 2012. – № 1 Kg ; URL: www.es.rae.ru/mino/159-1214 (дата обращения: 15.11.2012). 7. Козубцов И.Н., Федорова Е.О. Кредитная война и её последствия: опыт Испании [Электронный ресурс] // Междисциплинарные исследования в науке и образовании. – 2012. – № 1 Kg. – Режим доступу URL: www.es.rae.ru/mino/159-1217 (дата обращения: 15.11.2012). 8. Загрубский А.А., Цыганенко Н.М., Чернова А.П. Спектральные приборы. – СПб., 2007. – 76 с. 9. Яворский Б.М., Селезнев Ю.А. Справочное руководство по физике для поступающих в вузы и для самообразования. – 4-е изд., испр. – М.: Наука. Гл. ред. физ.-мат. Лит., 1989. – 576 с. 10. Козубцов И.Н. Место в перечне научных специальностей междисциплинарных диссертационных исследований в науке и образовании [Электронный ресурс] // Междисциплинарные исследования в науке и образовании. – 2012. – № 1 Sp. – Режим доступа URL: www.es.rae.ru/mino/157-453. 11. Козубцов І.М. Філософія формування міждисциплінарної науково-педагогічної компетентності вчених // Наука и образование : сб. тр. Международный научно-методический семинар, 13 – 20 декабря 2011 г., г Дубай (ОАЭ) – Хмельницкий: Хмельницкий нац. ун-т, 2011. – С. 120 – 122. – (укр., рус., англ.). – ISBN 978-966-330-133-4. 12. Беляев Е.А. Перминов В.Я. Философские и методологические проблемы математики. – М.: Изд-во Моск. ун-та, 1981. – 217 с. 13. Мараховський Л.Ф., Козубцов І.М., Масесов М.О. Міждисциплінарна академія наук (МАН), єдиний в Україні проект формування міждисциплінарної консолідації вчених // Materiály VIII Mezinárodní vědecko-praktická konference «Efektivní nástroje moderních věd – 2012» – Díl 20. Pedagogika: Praha. Publishing House «Education and Science» s.r.o. – Stran 22 – 25.